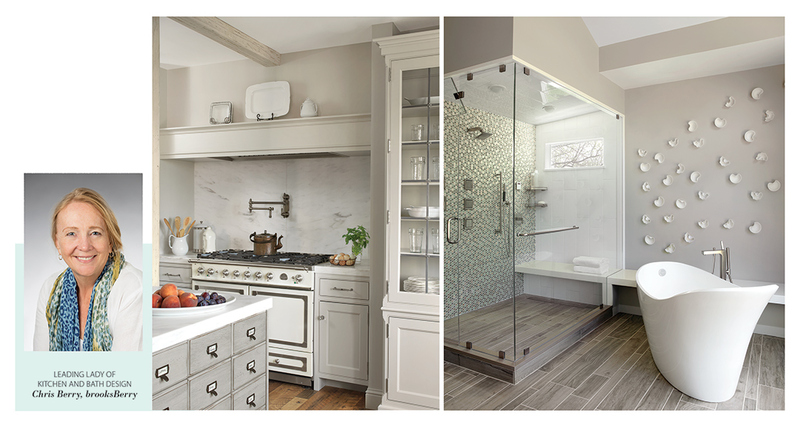 Chris Berry co-founded brooksBerry Kitchens and Baths in 1994 and quickly established a reputation for designing and building award-winning projects. Since the retirement of co-founder Mike Brooks in 2012, Chris has continued to lead her staff in designing spectacular spaces. Chris has won numerous national and local design contests and has received five prestigious Sub-Zero International Kitchen Design awards. In 2011, Chris was given the Best Kitchen award by the National Kitchen and Bath Association. In addition to her design work, Chris has also served on the design councils for various manufacturers, including Rutt Handcrafted Cabinetry, the local ASID board and more. She has served on the St. Charles City’s Historic Landmarks Preservation Board since 2008. Chris also was the featured kitchen designer for two seasons of the PBS TV show “Hometime.” Chris is a leading lady because she has shaped kitchen and bath design and shares her vast knowledge with those who have come after her in the St. Louis design community. Chris: My former boss, Mike Brooks, was downsized out of a job and he convinced me to take the leap, and we started brooksBerry a month later. Chris: Managing the expectations of clients, employees, suppliers, craftsmen and tradespeople. Happy people are the most productive, and happy clients drive our business with referrals. Chris: Being in control and accountable gives me great satisfaction and doing things well is my greatest reward. Chris: It takes self-confidence and a strong will to persevere – and having a lot of equity in your house to tap also help!